In General, each of us has an idea of which version of the browser uses when browsing websites. But sometimes you need to find out the most accurate designation of its release program. 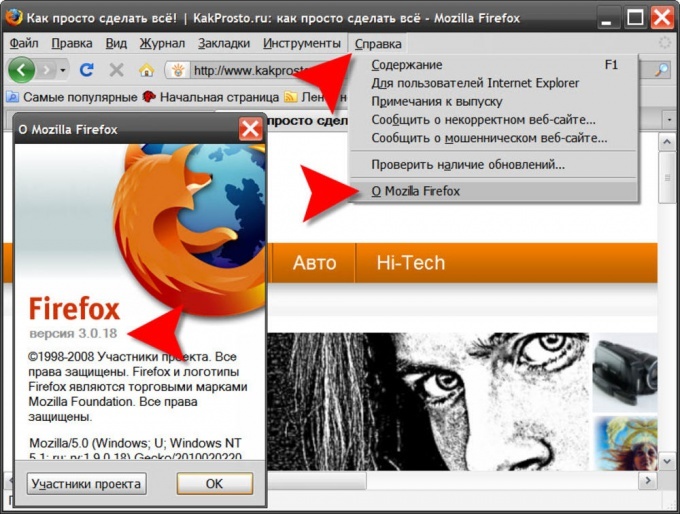 In Mozilla FireFox to check the version of the software, it is necessary to open the menu "help" section and click the lowest item ("About Mozilla Firefox"). Will appear in the vertical window, which specifies the exact version of the three dot-separated numbers placed directly under the large inscription of Firefox. In the Opera menu, too, need to open the "help" section and clicking in this bottom paragraph ("About"). But here, unlike all other browsers, a separate window is not popping up - it opens a regular page, most of which take a list of addresses of different kinds of vaults created by the browser in your computer. At the beginning of this list there is a separate section which is called "version Information". The version numbers of the Opera are two dot-separated numbers. In Internet Explorer, open the same section of the menu called "help", and clicking the last in the list item "About" page, you will see a window with a stern reminder about copyrights. In addition to this text there are no less serious a code indicating the version of the browser. In this point separated by four numbers, one of which has already passed the four-digit milestone. In Google Chrome, but not less serious code version (four dot-separated numbers), there is an indication of the most recent available for installation modifications. 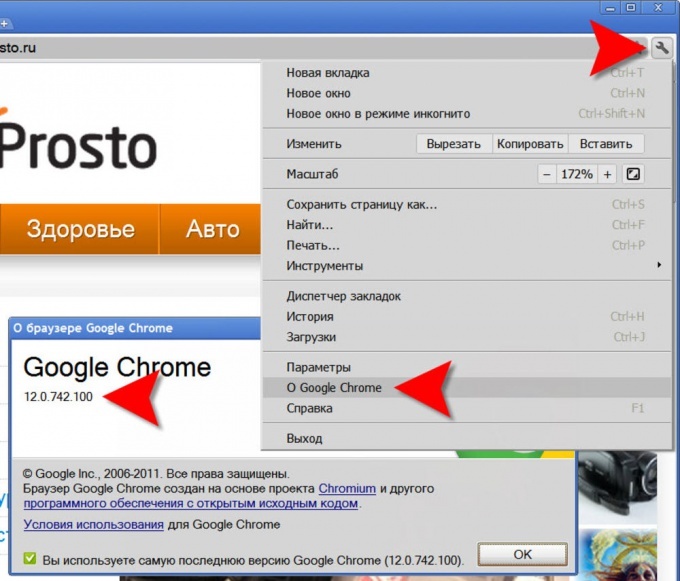 To see a separate window with all the information you need to open the menu click the icon with the wrench at the top right in the window of the browserand select "About Google Chrome". In the Apple Safari browser just in case there are two ways to open a window with information about version. 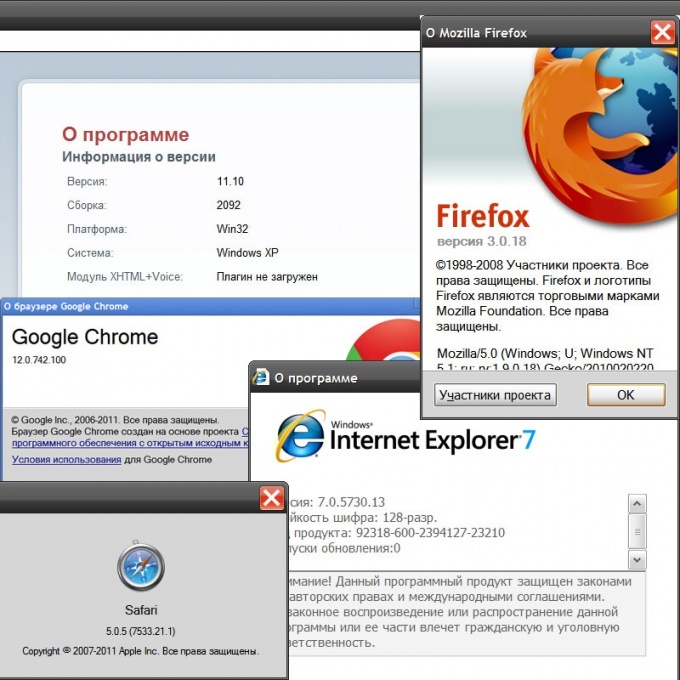 One of them is similar to the method of the browser Chrome - it is necessary to click in the same place the icon (here painted on it a gear) and select "About Safari". Another very similar with Safari and IE - have to open the menu "help" section and click the bottom item ("About Safari"). Apple invented the long version designation: in addition to the three numbers separated by a dot, there is also the addition of the three numbers in brackets.